FIBA Europe and FIBA TV's representatives have to be delighted with the EuroLeague Women game of the week that brought together two undefeated teams to close the first phase of this season's ELW. Perfumerías Avenida, playing at home, were defeated by Fenerbahçe SK in an exciting game that kept the home fans on the edge of their seats for the first 30 minutes. However before the review of the game of the week, the big question of EuroLeague Women round 7 is what happened to Galatasaray MP? The answer is simple they were beaten at home by Ros Casares (46-76). This was the first defeat of the competition for the Final 8 hosts. Ros Casares achieved this without having to play Lauren Jackson or Kata Honti. Ros Casares led from start to finish with Laia Palau and Sancho Lyttle scoring 20 points each. Silvia Dominguez added 11 points while dishing out 5 assists and making 2 steals. Ann Wauters (15 rebounds) and French international Isabelle Yacoubou-Dehoui added 8 points each. Diana Taurasi was the leading scorer for the hosts with 14 points. With this loss she has suffered her first home defeat in EuroLeague competition since February 2007. Bourges Basket did not play well and yet came away with the victory (69-67) against VICI Aistes. Bourges allowed a 10-point final quarter lead disappear in the last minute and were thankful for calm free-throwing by Styliani Kaltsidou (in picture) (20 points and 11 rebounds) in the last few seconds to seal the victory. 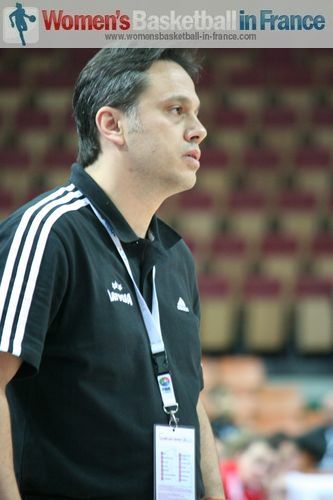 Vici-Aistes' head coach Mantas Sernius was convinced his team should have won and explained after the game: "I am very angry at my players because they didn't expect to win this game. Today the Bourges team did not play their usual game, so we just had to believe that we could win and take it. I hope our fans will forgive us because we always play for them." ZVVZ USK Prague were thankful for the coolness and composure of Eva Vitecková (24 points) in the closing minutes as they held off Lotus Gdynia in a tight finish (82-77). Ticha Penicheiro is enjoying her short stay with the Czech champions dishing out a game high 8 assists. Jolene Anderson who had been almost invisible when games were shown on TV scored a game high 26 points in defeat for Lotus Gdynia. With UMMC Ekaterinburg beating Seat Unisze Györ(97-60), the qualification picture in Group A at the moment is clear. Ros Casares and UMMC Ekaterinburg already have one foot in the next round, while at the moment the battle for the remaining two places are between Bourges Basket, ZVVK USK Prague and Lotos Gdynia. It does not matter what Tarbes do at the the moment, they just cannot win. Playing at home they led Beretta-Famila (40-38) with 24 minutes played. A little over two minutes later they had conceded 11 points and trailed (40-49). Despite a spirited finish Tarbes were unable to make up the deficit and lost for the sixth time in six games (66-75). Cheryl Ford enjoyed herself for the Italians with 16 points and 15 rebounds while Maja Miljkovi with 12 points and 3 assists was the best player for Tarbes. For Tarbes the chance of qualifying for the next phase of the EuroLeague Women is practically over with Nadezhda Orenburg beating CCC Polkowice (69-67). Fenerbahçe SK trailed to their hosts Perfumerías Avenida (42-47) with 25 minutes played. Yet four minutes later they led (59-49) in a what turned out to be intriguing game. Perfumerías did reduce the deficit before half time but were unable to get the lead back during a see-saw battle in the final quarter. Angel McCoughtry was all over the place for Fenerbahçe: she defended, she passed, she ran the floor and also scored 28 points. For the defending champions Dewanna Bonner scored 24 points. Most of the EuroLeague games from Spain appear on youtube. So this is a game to watch. George Dikeoulakos (in picture), the coach from Fenerbahçe, said after the game: "This is the first time I had the chance to play here and I have to congratulate Avenida for the little miracle they accomplished here with their winning streak. Miracles don't usually happen in basketball, behind them there is a lot of work from the players, the coaches and the club. Today we had the extra motivation of terminating their winning run on their own court. To do so, we've been alternating defenses during the whole game and everything worked fine except for defensive rebounding until the half time. In the second half we managed to control rebounding and the personality of my players to manage the environment." Wisla Can-Pack Krakow went to work in the final quarter and came away with a road victory against Gospic Croatia (73-65). Once again the WNBA experience of Nicole Powell was a key factor in the win. She finished with 22 points. Good Angels Kosice huffed and puffed for 32 minutes against the youngsters from Frisco Brno (54-51) before pulling away with a 17-0 run to win the match (71-54). You can read how Sparta&K Moscow Region beat Montpellier (72-70) in our article with the Russian club escaping with a home victory against Montpellier in an another perfect afternoon of Russian basketball. Rivas Ecópolis made it five wins on the trot in a nail biting finish against Cras Basket (74-70) to complete round 7 of the EuroLeague Women. Rivas Ecópolis, Sparta&K Moscow Region and Wisla Can-Pack Krakoware all tied for first place in the group with 5 wins each and are well on their way for qualifying for the second round. While Lattes Montpellier and Good Angels Kosice are close behind the leaders in joint fourth place with four victories also have a two-game lead over the teams in sixth place.